Bukittinggi is famous as a highland town surrounded by the natural contours of the hilly. Natural conditions around the city into a separate boon for the city with the cool air of this. Besides having fertile land, the city has a very beautiful natural scenery in almost all corners, so that the main attraction for the tourism sector. 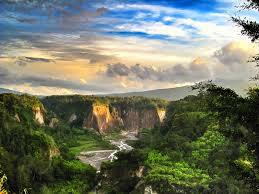 One example is the panoramic beauty of the landscape around the canyon Sianok. Sianok canyon is a narrow valley surrounded by steep rugged hills dotted with little stream in the middle. Sianok valley contours formed by the process of the decline in most slab of the earth, causing a fracture tangible steep ravine. 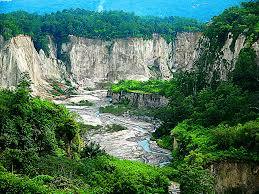 Sianok Canyon is a steep valley (ravine) located in the border town of Bukittinggi, in the district IV Koto, Agam, West Sumatra. The valley is elongated and meandering as the border town of Koto selatanngarai Tower to nagari Sianok Anam Tribe, and ends in the district Palupuh. 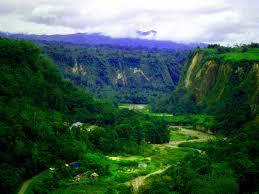 Sianok canyon has a very beautiful view and also one of the best attractions province of West Sumatra. Sianok Canyon is located on the border of Bukittinggi well as a borderline southern part of the canyon until Sianok Anam Koto Tower Tribe, until Palupuh area. The scenery in this area is very beautiful and become one of the best tourist sites. A cool location with an amazing natural scenery make it an ideal place for vacation with family. Fault Sianok canyon forming steep walls and also form a green valley formed naturally is through the movement of the earth's crust and fall and flowed with rod or Sianok River. In the Dutch period, Sianok canyon also referred to as buffalo as many buffalo at the bottom of this canyon. As a holiday destination in London, Sianok canyon can be enjoyed by exploring the River Sianok. This can be done by using a canoe or kayak as ingredients. These are will be passed on to Jorong Sitingkai Lambah Nagari Nagari Palupuh takes about 3.5 hours. Although most of the walls are never collapsed by an earthquake in 2007, Canyon Sianok still interesting and exotic power loss. Even that year, Sianok canyon set as the best object tourism (attractions best) on the award of Padang Tourism Award (PTA) 2007 at the Padang. Sianok canyon flowing river valley Sianok quite clear. The river can be used for sports activities such as canoeing, rafting and kayaking. The river empties into the Indian Ocean. On the banks of the river still found many rare plants such as Rafflesia flowers and herbs. While in the forest in the valley of the canyon, there is some wild fauna which can still be found, such as: long-tailed monkey, gibbon, mitered, deer, wild boar, leopard and tapir. To reach this location, tourists can use a landline. From the city of Padang to Bukittinggi, the trip can be reached in approximately 2 hours away by public transport, at a cost of between Rp. 15,000-20,000, - each person (February 2008). After arriving in the city of Bukittinggi, the journey can continue to use public transportation to the location Sianok canyon. To anticipate that not changing the car, the tourists are encouraged to use the services of travel, personal car or a rental car that can go directly to the location of attractions. 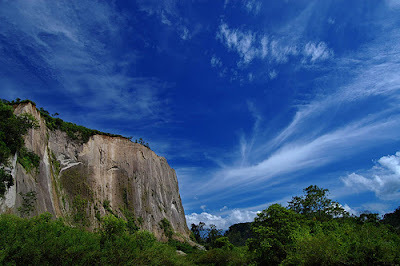 Sianok Canyon, located in the city center of Bukittinggi. In this city there is a comfortable hotel for a place to stay for tourists who come from out of town. Hotel types ranging from cheap to very expensive rates. For the problem of food the tourists are spoiled by a wide range of dishes Padang. Rice Kapau become one of the menu interesting to try that are in the Market Slope (in addition to Upper Market). In the garden, located in Jalan Panorama, Bukittinggi, visitors can relax for a moment while admiring the beautiful scenery and perpetuate this valley. While enjoying the atmosphere, visitors can also buy some souvenirs from London at kiosks along the trail this park.